No.1 wheelchair supplier in Singapore. Get from the sole agent of Karma & Soma wheelchairs. Are you looking for a wheelchair? Need to purchase a wheelchair permanently? Or just need a wheelchair for a short period of time? Or simply just want to know more about wheelchairs? The most reputable and experienced home care products supplier in Singapore & Malaysia. We supply to all hospitals, clinics, pharmacies, departmental stores & medical stores. We are the sole authorized agents of many high quality brands, i.e: Karma, Soma, Abena, OppO, Etac, Backjoy, Sunrise etc. We have the widest range of wheelchairs with different qualities and specifications for different needs. We understand your needs most and will provide the most suitable solutions to you. We offer the most competitive pricing in the market. we offer the widest range of wheelchairs you can ever find in Singapore. all our wheelchairs are safe, clean, durable, user-friendly & comfortable. we care about both the wheelchair user and the caretaker. you may choose from either standard, detachable, elevating or reclining wheelchairs. We offer the best rental rates in town, with the best possible wheelchairs. You may come to our service centre to try the most suitable wheelchairs. There will be no delivery charges for own collection. You just need to call up our hotline (6254 2916 or 6254 2927) to ask for a rental of wheelchair. Our friendly professional staff will assist you from there. You may walk up to our exclusive showroom at Square 2 #03-20 & 21 (just right above Novena MRT, next to Tan Tock Seng Hospital). Our caring promoter will provide the best service to you. Our retail hotline is 6254 1332. Click here to see how to go to our retail showroom. 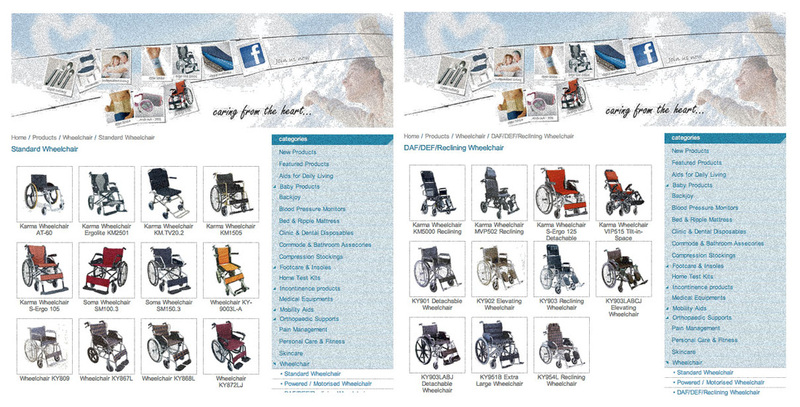 Alternatively, you may look for our online wheelchair catalogue at: wheelchair sale. You just need to call, email and come straight to us. We will provide you the best solutions according to your special needs. Please call us to make an appointment should you need to repair your existing wheelchair. You will need to come down with the wheelchair to our service centre. We apologize that there are no door services as the repair work needs the warehouse facility and spare parts. Our Company is HSA licensed importer and wholesaler of wheelchair in Singapore. We are also GDPMDS (Good Distribution Practice for Medical Device Singapore) certified. All our wheelchairs are registered and approved in Singapore.